When saving a Microsoft Project 2010 file, you can select the File tab, Save As, which will open the Save As dialog box (refer to Figure 2). You can also save your project file by using the Ctrl+S keyboard combination. This option works only if the project has not been previously saved. If the file has been previously saved, your latest changes will be saved to the previously designated location. In the File Name box, enter a descriptive filename. This name will be used when printing reports, displaying your file, and any other viewing of your project, so ensure that the name conveys the purpose of the project. The Save as Type drop-down box provides several options for the file types, as described in Table 1. Project .mpp The standard file type for individual project files for Microsoft Project 2010. Microsoft Project 2007 .mpp The standard file type for individual project files for Microsoft Project 2007. Microsoft Project 2000–2003 .mpp The standard file type for individual project files compatible with Microsoft Office Project 2000, 2002, and 2003. Project Template .mpt A special type of project file containing a group of tasks or resources to be used as a starting point for creating project schedules of similar type in Microsoft Project 2010. The templates will not be compatible with previous versions of Microsoft Project. Microsoft Project 2007 Templates .mpt A special type of project file containing a group of tasks or resources to be used as a starting point for creating project schedules of similar type in Microsoft Project 2007. The templates will not be compatible with other versions of Microsoft Project. PDF Files .pdf Adobe Acrobat standard pdf files. XPS Files .xps A Microsoft alternative to Adobe Acrobat files. Excel Workbook .xlxs The file format used to export project data to Microsoft Office Excel. When you save a project file using this format, the Export Wizard is launched, enabling you to select the types of data (Task, Resource, or Assignment) and fields within those data types to be included in the Excel spreadsheet. Excel Binary Workbook .xlsb The file format used to store Excel files in binary. Excel might be able to open particularly large files saved in this format more quickly. Excel 97–2003 .xls The file format used to export project data to Microsoft Office Excel 1997–2003. When you save a project file using this format, the Export Wizard is launched, enabling you to select the types of data (Task, Resource, or Assignment) and fields within those data types to be included in the Excel spreadsheet. Text (tab delimited) .txt The file type used to export project data into a tab-delimited text file. This format can be useful if you are planning on importing it into another system, such as a database, that you can then use to model the data. When this file type is used, an Export Wizard is launched, enabling you to select the data types (Task, Resource, or Assignment) and the fields within those data types to be included. CSV (comma delimited) .csv CSV stands for Comma Separated Values and represents a format commonly used by many databases, where each record is a single line and each field in the record is separated by a comma. This type of file format can be then imported into an external database system, as well as Excel. When this file type is applied, an Export Wizard is launched that enables you to select the data types (Task, Resource, or Assignment) and the fields within those data types to be included. XML Format .xml XML stands for Extensible Markup Language and is a widely used file format for manipulating data. XML is used for document creation and was developed to replace HTML, as it is more versatile and provides better document structure. When you save your project file in this format, the entire project information is exported, including all project details and statistics, calendars, tasks, resources, and assignments. Each part of the data is located on its own node, with the sub-values indented in the leaves below it. You can use this file type to export your project data to be used in any other external system for viewing or analysis. As of the 2007 version, Microsoft Project no longer supports the Project Database (.mpd), Microsoft Access Database (.mdb), and ODBC Database file types. You can use the widely accepted standards of TXT, CSV, and XML, which can be read and imported into practically any database system. When sharing project files among multiple people, it is important that you protect the highly sensitive data and the data you do not want other people to change. 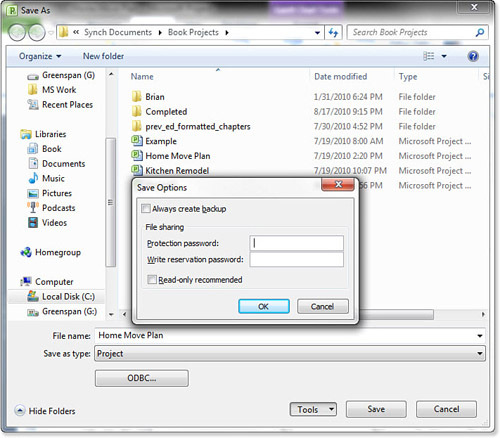 Launch the Save As dialog box by selecting the File tab, Save As. In the bottom-left corner of the Save As dialog box, select the Tools drop-down and choose General Options (see Figure 3). Figure 3. Use the Save Options dialog box to protect your project file. Always Create Backup— You can create a backup of a previous version of a file every time you save the file. This option is very useful because it prevents you from overwriting the previous file version, enabling you to always roll back. Protection Password— You can password-protect the file by creating a password. If you apply this option, anyone attempting to open the file will be unable to, unless they know the password. Write Reservation Password— You can write-protect the file, which allows any user to open a read-only copy of the file, but in order to save any changes to it, the user must know the password. Although this does not prevent users from saving their changes under a different project name, it does give you control over who can change your project file. Read-only Recommended— You can also save the project file with the warning that lets other users know that you prefer them opening the file in a read-only mode, forcing them to save any changes they make to a different filename and preventing potentially unwanted changes or loss of data. Click OK to save your changes or click Cancel to exit without saving.